Everything you need for a great parent workshop is included! The CD-ROMs include the Presentations, the Handouts for the participants, and a comprehensive Presenter’s Guide. Presentations are provided in PowerPoint, as well as PDF’s (for overhead presentations). Every workshop is available for you to present in User-Presentation Mode. Plus, the Reading Together workshop is available with an Auto-Play mode: simply start the PowerPoint and it will play through the entire presentation, including professional audio and video. Nothing could be easier! You can even post the presentation on your website as an additional parent resource. All workshops can be easily tailored to your audience and desired length of time. And, while these workshops are primarily designed for parents, they can also be great workshops for classroom teachers and literacy tutors! Research-based and developed with reading specialists, Bruce Johnson, M.Ed., and Dorothy Taguchi, Ph.D. These two mini-workshops (30 to 45 minutes each) will motivate parents to get more involved in reading with their children and teach them skills they can use to maximize the benefits of reading together. The first workshop covers best practices in reading together. Parents will learn why reading together is important, three styles of reading together (choral reading, echo reading, and shared reading), skills to use when reading to their child, and skills to use when their child is reading to them. 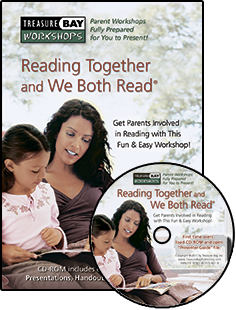 The second workshop covers books specifically designed for reading together, focusing primarily on use of the We Both Read series. This section includes information on how to maximize the benefits of using We Both Read and offers parents an opportunity to practice using the books. Purchase of this CD-ROM includes a school-wide site license to modify and present the workshops. Click here to see product pages for the two versions of this workshop. Click here to download and view a PDF sample of the slides and handouts for this workshop. For presentations to parents, there are two mini-workshops included, one focusing on phonemic awareness and one focusing on phonics skills (Length: 1 to 2 hours each). A longer and more comprehensive version, combining both workshops (total 4-6 hours), is included for presentation to classroom teachers and teachers’ aides. 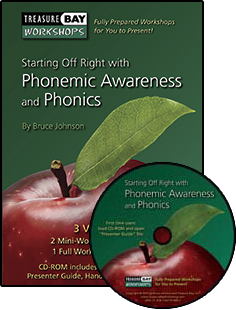 The phonemic awareness presentation focuses on verbal games and activities parents can do to help prepare their children for reading. Parents will learn how to help their child develop the ability to hear, identify, segment, and blend the individual sounds in spoken words. The phonics presentation focuses on the relationship between sounds and letters and how to blend letter sounds together to decode written words. Parents will learn simple games and activities they can do anytime with their child to reinforce phonics skills in reading. Purchase of this CD-ROM includes a district-wide license to modify and present the included workshops. Click here to go to the product page where you can add this workshop to your cart. This workshop is designed to let parents know what they can do to help their children be better prepared for reading instruction. An ideal time to present this workshop is in the first half of kindergarten or before formal reading instruction begins. The first section of the workshop focuses on reading to your child, as well as fun activities to do with your child to help develop phonemic awareness. The workshop not only shows how important it is to read to your child but also covers how parents can maximize the benefits for their child. The second section of the workshop includes fun activities to help your child learn the names and sounds of the letters in the alphabet. It also includes how parents can begin to introduce reading together activities, even with children who are prereaders. Each section of the workshop can be presented in about 30 minutes. Please note that much of the material in this workshop is covered in the other two workshops above. 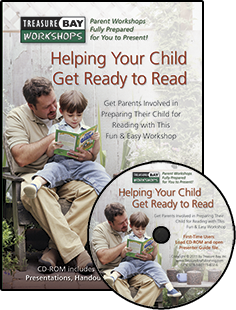 However, this workshop is tailored specifically to parents of prereaders.